Hi! Lester Higa here. I served in Vietnam from April 1970 to June 1971. 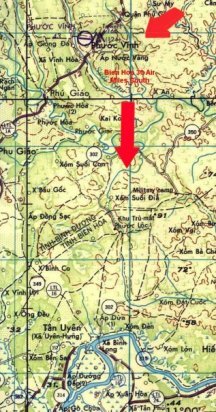 When I joined “A” Battery 6/27 Arty in the field, the battery had just made the move from Quan Loi to Loc Ninh ([Webmaster Note] After stops at FSB Burkett and FSB Ft. Defiance and other locations). We weathered through the last of the dry season and a full monsoon season there and supported the 11th ACR and 1st Cav. ([Webmaster Note] For C/2/12 Cav history see http://www.tallcomanche.org) while there staging for and operating in Cambodia. Most of our missions were fired into the Fish Hook and out to Snoul, Cambodia with the 175’s. 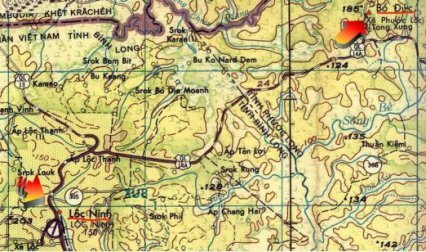 During the “Cambodian Extraction”, when the “Black Horse” and “Air Cav” were returning from “over the fence”, two 175’s from “C” Battery at Song Be ( Near Phouc Binh), located to our Loc Ninh FSB and we fired four 175’s ‘round the clock for over one week. We shot the tubes out of the guns and had to change tubes while continuing to fire missions into Cambodia. After all U.S. Forces returned from “over the fence”, the “C” Battery guns returned to Song Be and we continued to fire “arc light follow-ups”, H&I's and intelligence targets triggered by electronic sensors in Cambodia. I guess that we were there until September or November of 1970. Some time after the monsoon season passed and the roads began to dry out, we were ordered to move to Bu Dop (aka Bu Duc). (See map). This move allowed us to reach more of the area to the south and east of Snoul, Cambodia and the bunker complexes the 11th ACR and 1st Cav. had uncovered while in Cambodia. The move may have been undertaken in the October/November 1970 time period. By December 1970, we were definitely settled into Bu Dop, as you will notice by the Christmas of 1970 pictures. 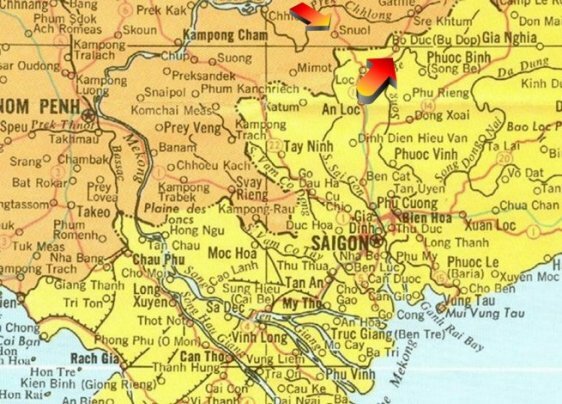 The months spent at Bu Dop were primarily devoted to firing missions into Cambodia based on the calls for fire from air observers flying near, on or over “the fence”, from electronic sensors seeded into the Ho Chi Minh Trial and roads, and from pre-scheduled H&I fires based on “intelligence” reports. 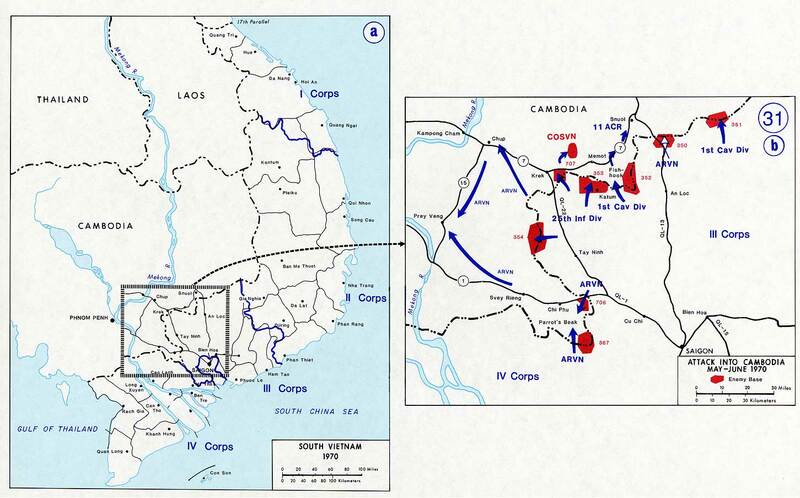 There were occasional missions fired in direct support of ARVN units and local RF/PF units. There were even some rare “friendlies in contact” missions we fired for ARVNs, their U.S. advisers and for the “A” team at the Special Forces camp next to us. This period was probably from October/September 1970 to April/May 1971. 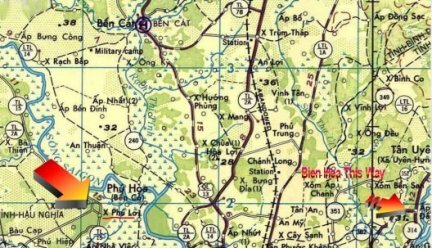 Some time in the April/May 1971 time period, we moved to Song Be and settled there to support ARVN operations. 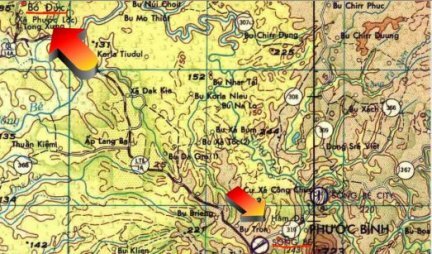 I DEROS’d from Song Be and returned to the Phu Loi where the Battalion HQ was located with only 3 days left “in country”. I left from Tan Son Nhut on a C-141 and we flew to Clark AFB, Philippines and spent the night. Next morning, we left for Guam and spent a couple of hours at Anderson AFB and then continued on to Hickam AFB, Hawaii. We got there around mid-day and were then bussed to Schoffield Barracks, Hawaii (home then and today of the 25th Infantry Division) to be processed for separation from active duty. Because I had extended my tour in Vietnam for an additional 46 days, I had less than 180 days of active duty remaining and was eligible for the “180 day drop” or an “early out”. Consequently, I was separated from active duty and reassigned to the Inactive Reserves. I received my discharge in 1975. In early 1971, during the period that the 1st Cav. was standing units down and sending them home, they found that they had one brigade holding down the entire Division AO and decided to "scrounge" up forward observer teams from the 23rd Groups artillery battalions. 2nd Lt. Terry Harvick was "low officer on the totem pole" for our FDC section so he was "volunteered" to find two more "volunteer" EM for his FO Team. I decided to help him out and we found a great Driver/RTO in Bill Knapp. The picture was taken while we were waiting for Bill and were outfitted with some Korean web gear that the "Mess Daddy" could scrounge up. We were headed for Phouc Vinh to go through an 1st Cav. orientation and were latter assigned to D Co., 2 Bn, 7th Cav. We served with them through the area south and east of the Parrot's Beak and south of Cu Chi. Glad to say that we all returned to A Btry after a couple of months without a scratch.